Social Economic Environmental Design (SEED) Network, Universidad Nacional Autónoma de México (UNAM), the BASIC Initiative, and Design Corps announce that six projects have been selected for the Public Interest Design Awards: Mexico through a competitive jury process. 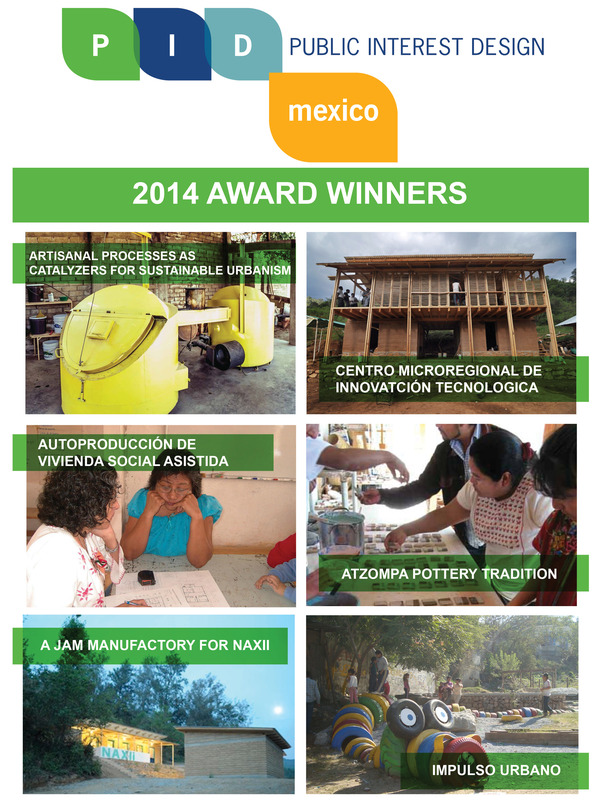 The winning projects will be presented at a public two-day global convening in Mexico City on September 11-12, 2014. The six project winners were selected through a competitive jury process. Jurors included: Dr. Michael E. Conroy, Teddy Cruz, Josep Maria Llop-Torné and Gabriela Videla. Project selection criteria: Effectiveness, Excellence, Inclusiveness, Impactful, and Systemic and Participatory. The winners will receive round-trip air fare to Mexico City and two night’s lodging to present at the conference Public Interest Design-Mexico which will be held at Universidad Nacional Autónoma de México Facultad de Architectura (UNAM). Read the juror bios here. Public Interest Design – Mexico is an opportunity to discuss the practice of designing for social impact and how best to significantly increase the value of design for the public good. Projects are being created all over Mexico which are addressing the many issues we face as a nation, in communities and as individuals. These projects are taking on the challenging issues of democratic decision making, empowerment and engagement. While inclusive design practices worldwide are beginning to help communities use design to address their most critical issues and define resilient futures as they see fit, as in Mexico, design professionals still remain at the margins of these lively debates and initiatives. The two-day symposium will provide participants from a wide range of national expertise—NGO’s and community organizations, architects, agronomists, environmentalists, anthropologists, economists, public health officials, and university academics–with a chance to study how design can add value and momentum as communities tackle a myriad problems. Design can help defend equity, and provide political recognition, which create extraordinary interdisciplinary teams and across networks producing solutions to the real priorities faced by communities in need. It’s also high time we better articulate clear career paths for young public interest designers. The conference will focus on two important sub-themes within Public Interest Design: Day One will be a session devoted to Design that Enables and Empowers Communities and will examine the possibilities for engagement and involvement for designers in projects that address the needs of communities, from equitable access to health, education, economic development, protection of their environment, cultural heritage, and legal rights. Morning and afternoon sessions will consist of three 30 minute presentations by the speakers selected by jury members. 10-15 minutes will be reserved for discussion between the jurors/moderators and the speakers. Open discussion will follow at the end of the morning and afternoon sessions. Day Two will be structured around a series of workshop/roundtables that will address the issues and themes that emerged from day one. The potential and benefits of creating a Mexican network, and possibly one connected to other Latin American countries, is the value of the SEED metric to this network, for both practitioners and communities in need, and how best to help support viable and sustained action in their benefit. Projects in progress or completed in the past three years are eligible. Professional, design student, community organization or NGO based, academic and do-it-yourself projects will be considered that have a fundamental connection to a design process. The presentations may be based on work undertaken in Mexico, and its borderlands. Public Interest Design Mexico is co-chaired by Bryan Bell from Design Corps and Dr. Hermilo Salas Espíndola, of the UNAM, and Sergio Palleroni of the BASIC Initiative, and Comunidad AC, Mexico. Funding for the conference and exchange was generously provided by the Fetzer Institute whose mission is to foster awareness of the power of love and forgiveness in the emerging global community. Dr. Michael E. Conroy is an academic economist who taught at the University of Texas at Austin, and Yale for three decades . He has also spent a dozen years in philanthropy helping to build many of the certification systems which promote social and environmental impacts for all sectors of society. His book Branded: How the Certification Revolution is Transforming Global Corporations (2007) is considered a groundbreaking text for many organizations working to preserve both native habitats and the rights of indigenous cultures. Teddy Cruz is recognized internationally for his urban research of the Tijuana-San Diego border, advancing border immigrant neighborhoods as sites of cultural production, from which to rethink urban policy, affordable housing and civic infrastructure. His investigation of this geography of conflict has inspired a practice and pedagogy that emerges from the particularities of this bicultural territory and the integration of theoretical research, pedagogy and design production. His practice and research convene knowledge from across the fields of architecture and urbanism, environmental and social practice, political theory and urban policy, visual arts and public culture, and mediate the interface between top down institutions (governments, universities, foundations) and bottom-up socio-economic, cultural and environmental intelligence embedded in communities. He is currently a Professor of Public Culture and Urbanism in the Visual Arts Department at the University of California, San Diego, where he co-founded the Center for Urban Ecologies with urban curator Kyong Park in 2010; and co-founded the Blum Cross-Border Initiative with political theorist Fonna Forman in 2013. He is also presently a special advisor to the City of San Diego on Urban and Public Initiatives. Josep Maria Llop-Torné is a leading Spanish architect and urbanist, Llop-Torne has played an importand role in Spanish urban design and research since the 1970s. He has been both architect and planner on the master plans for Barcelona, Vic, Lleida, and the territories of Catalunya, for which he received prizes from both the Spanish academy and international bodies. An important international academic, he has also authored several important studies including the multi-nations UN study on the methods and mechanisms of urban design to help redistribute income in Latin America ( Instrumentos de redistribución de la renta urbana (2005). In 2010 Llop-Torne received the Catalan Academy’s Gold Medal for his contribution to urban design in Spain and internationally. Josep Maria Llop-Torne is currently the Director of the UIA-CIMES/UN program for médium size cities. Gabriela Videla began her professional career as a journalist and organizer of the women’s movement in Chile under Allende. In 1974 she became a political exile in Mexico and then a citizen. In the last four decades in Mexico, she has been a key figure in the community development world, in both informal settlements and rural areas, both in promoting discourse, heading and financing development work focused on the plights of women, children and families in Mexico. In that period she has led and help create several not for profit development groups which have promoted the well being of the families of the very poor, including Centro de Encuentros y Dialogos (CED), CIDD, and most recently Comunidad AC, a financing group which has introduced new strategies for self financing and development in a time of conflict for Mexico. Gabriela continues her writing, and is also noted author and poet.